In California they don't throw their garbage away -- they make it into television shows. -- Woody Allen, "Annie Hall"
Jappy is a Japanese dictionary and study tool. 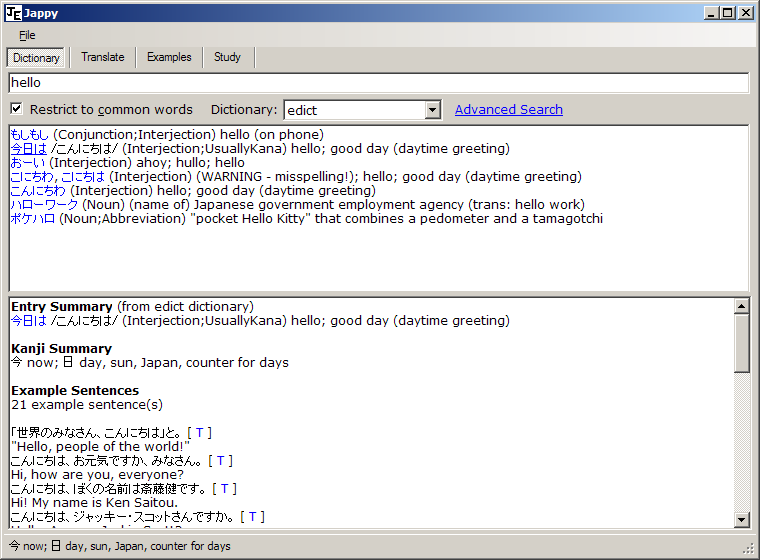 It provides a Japanese-English dictionary, translation in Japanese text, example sentences, and a study list. I have a long list of features that I've been meaning to implement, but probably never will, so I decided to make it public before it was done. It's actually in pretty good shape, though. I use it often. Update: I did use it often, but no longer do. The program is still useful, but has at least one serious, unfixed bug in the translation tool, and I have long since stopped improving it. WWWJDIC, which was something of a competitor, has continued advancing and is mostly superior to my program now. As long as nobody asks me to update it, it will probably remain as it is. General - In general, help will appear in the status bar when you mouse over UI elements. You can select text and right click it to perform actions on it, or right-click hyperlinks. Clicking a hyperlink will perform an action, usually looking up the word beneath the hyperlink or translating a sentence. The keys F1-F4 select different tabs within the program, and the key combination <Windows>-G (the Windows key is next to the Alt key) will hide and show the program, so you can keep it in the background and quickly pop it up to look up a word without reaching for the mouse. In most tabs, you can press the TAB key to move the cursor to the search box, so you can quickly perform another search. Japanese-English dictionary allows you to search for English and Japanese words, limiting searches by word type and sorting by popularity. Japanese text can be input as roumaji, and wildcards can be used. By default, exact match searches are performed, but you can prepend and/or append an asterisk to a query. When searching in English, you can add multiple words and it will search for examples containing all of them. You can prefix a word with - to exclude results containing that word. 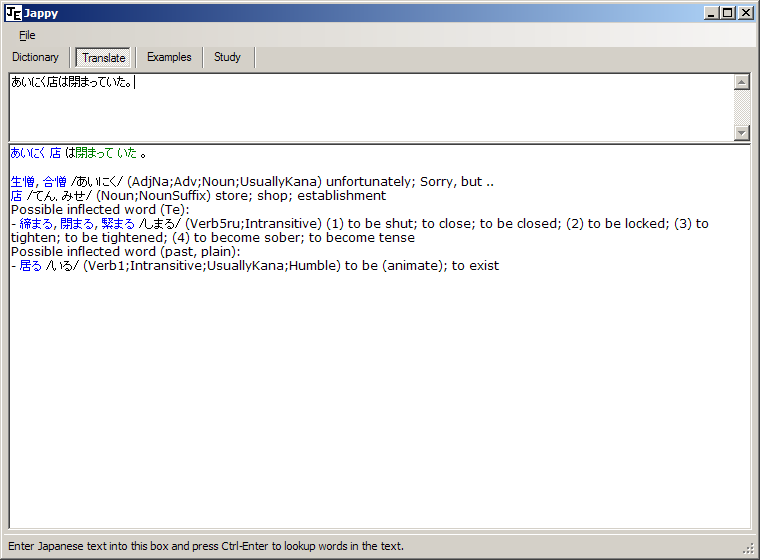 The program also accepts quoted phrases, eg "good morning", but will show an error box if you actually use them. That feature's not implemented yet. Search for words having an English meaning that includes "hello". Search for words having an English meaning that includes "good" and "idea", but not "plan". Roumaji input. A search for the phrase こんにちは. Japanese input. This should return the same results as above. All words starting with こん. Same as above. Notice how the asterisk goes after the 'at' symbol, not before. Translation will find words in Japanese text and translate them. I based this feature on Jim Breen's WWWJDIC, but my algorithm for parsing Japanese text is superior. (On the other hand, he has a large dictionary of hand-picked words that he uses to guide his algorithm, so it's better at translating kana than mine is.) The program does not attempt natural language translation. Rather, the program acts as a translation aid by picking out Japanese words in text, even when they are inflected (conjugated), and displaying possible meanings for them. This feature only accepts Japanese text, and is far better at translating natural Japanese text containing many kanji than it is at translating all kana. This tab can be accessed by pressing F2. Example search lets you search examples in both English and Japanese. It accepts the same query syntax as the dictionary search. You can click the T next to a sentence to run the sentence through the translation function. You can access this tab by pressing F3. Study tools are where I have the most missing functionality. 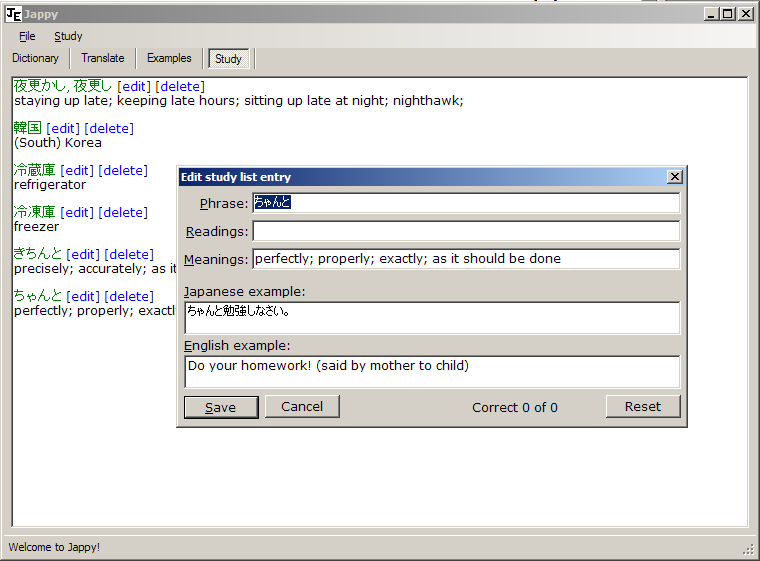 You can add words to study lists, create study lists from kanji automatically, and view flash cards from a study list. The flash cards automatically adapt their frequency to show the ones you need more help with more often. This tab is accessible by pressing F4. The selection of text is a bit quirky. I wrote the hypertext document renderer myself and making the selection work correctly while still having high performance was so much work that I didn't do it. So if you want to select a given word, you may have to select a bit more than you want and then remove the extra part. 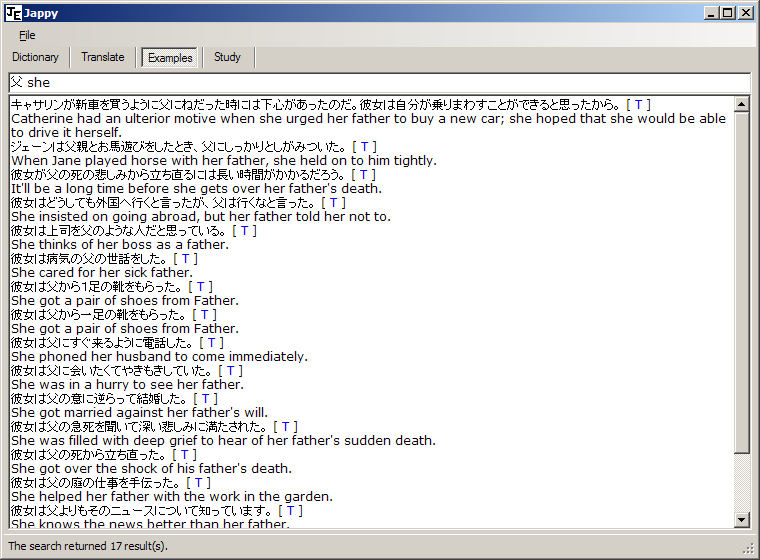 The dictionaries used by the program were created using the raw dictionary data from Jim Breen's Japanese page. This program would be useless without the thousands of pages of dictionary data upon which it relies. If you've already downloaded the most recent dictionaries, you can quickly update the executables by simply downloading them and replacing the ones you already have. Otherwise, download both archives and extract them into the same location. Before running Jappy, you will need to install the Microsoft .NET Framework 2.0, if you don't have it already. Fixed a bug that caused ky[aiueo] to not be recognized by the roumaji to kana converter. Added support for "nn" to the roumaji to kana conversion.